Surprise OSHA Inspection? What to Expect. The inspector will present credentials, which contain a photo and serial number. Always ask to see these and report to law enforcement any inspector who asks for payment during an inspection (a real inspector will never do this). The inspector wants you to understand the inspection process, so he or she will explain the reason for the inspection and the procedures. Your company will select someone to accompany the inspector - decide who this will be ahead of time - and an employee representative will be selected as well. The inspector will tour the facility with the chosen representatives. He or she will observe hazards and whether any violations are present. An inspector may point out problems that can quickly be corrected. Employers should correct these issues immediately, though they will still be cited for violations. During the tour the inspector will also look at worksite injury/illness records, assess the company’s health and safety program and talk with employees about their impressions of safety in the facility. The inspector will inform the employer and employee representatives of his observations and give a general sense of the findings. At this time you will learn possible courses of action including following up with OSHA’s area office with questions or contesting the findings. The results of an OSHA inspection will arrive by certified mail. If your company violated any OSHA standards, you will receive citations explaining what requirements were violated, what the penalties are and how soon corrections to hazards need to be made. You will need to post these citations in the relevant areas until the problems are fixed (or for three days, whichever is longer) so employees are aware of the issue. Creative Safety Supply is committed to being your safety and labeling experts. We provide a wide range of industrial safety products to increase visual awareness and safety. We can help with OSHA compliance. Call today! Have you thought about the possibility that an OSHA inspector could show up at your facility? It could happen, and it’s best to be prepared so you aren’t caught off guard. 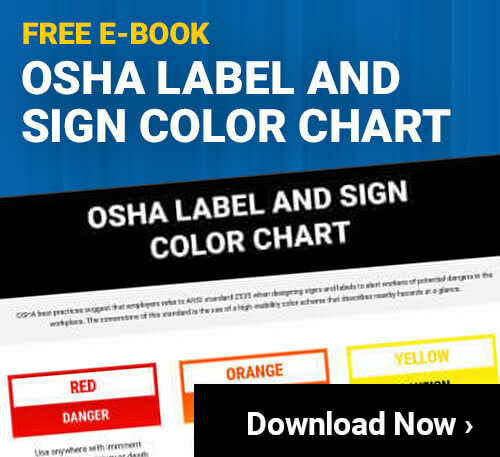 This infographic explains the four main parts of an OSHA inspection and what you should do during each stage to ensure the inspection goes smoothly. You’ll also find out what to do if you are notified you’ve violated any of OSHA’s safety standards.